The Bolivian president named capitalism itself as the key enemy of nature. At the subsequent World People’s Conference on Climate Change and the Rights of Mother Earth, held in April 2010 in Cochabamba, Morales had this to say to Amy Goodman of Democracy Now! We are here because in Copenhagen the so-called developed countries failed in their obligation to provide substantial commitments to reduce greenhouse gases. We have two paths: either Pachamama or death. We have two paths: either capitalism dies or Mother Earth dies. Either capitalism lives or Mother Earth lives. Of course, brothers and sisters, we are here for life, for humanity and for the rights of Mother Earth. Long live the rights of Mother Earth! Death to Capitalism! Much of the celebratory response, like the ritual demonization, relies heavily on the regime’s image-promotion and Morales’s supposed commitment to communitarian socialism. Within Bolivia, the theoretical debates on the origins and character of the MAS are more firmly rooted in reality. Getting a handle on these competing intellectual currents can be enlightening when this understanding is related to the historical conditions out of which they arose. The development model that gradually unfolded over the entire four years of the first MAS administration (2006–2010) is best understood by locating it within wider debates that have exploded throughout the Global South since the mid-1990s. A crisis of neoliberal legitimacy has made itself increasingly visible, however unevenly, across large swaths of the Global South over the last fifteen years. The latest crisis in global capitalism, beginning in 2008, has accelerated this trend. The response of ruling classes and their organic intellectuals has been adaptation, not transformation, of the neoliberal project. A new consensus in mainstream political economy circles, international financial institutions, and state managers in the Global South suggests that unbridled market fundamentalism has been insufficient and is unsustainable in light of the intense social conflicts it tends to produce. The best way to facilitate the full flourishing of the market, the new consensus argues, is to embed the market in a coherent set of institutions, with a more active state that engineers subtle movements in Adam Smith’s famous “invisible hand.” The state might even need to take control, directly or indirectly, of the means of production and allocation in order for the market to perform. Latin American neostructuralism as a theory of development has sanitized ECLAC’s classical conceptualizations of Latin American political economy by excluding the thematic foci of conflict and power relations from its analytical lens and policy prescriptions. Indeed the new theory is better described as a reconstituted neoliberalism. This theoretical and practical shift across large parts of Latin America, from neoliberal orthodoxy to a reconstituted neoliberalism under the guise of neostructuralism, has played itself out in the Bolivian context in ways specific to the country. As early as the first year of the Morales administration, there were clear signs of deep continuities with the inherited neoliberal model. Alone, the record of the first year might be dismissed as too early to detect any coherent pattern. However, an examination of the political economy of the Morales government over the next three years (2007–2010) reveals the deepening and consolidation of the initial trend toward a reconstituted neoliberalism. This is a tendency, not a law, and the trajectory of the Bolivian economy clearly continues to be subject to the changing dynamics of domestic and regional class struggles, formations, and alliances, as well as the changing character of global capitalism and geopolitical strategies of large imperial powers in the hierarchical world system of states. With that said, it is still important to record the observable and structural trend toward the consolidation of reconstituted neoliberalism in the first term of the Morales government. Most of Morales’s first four years can be described, from an economic perspective, as high growth and low spending. Prior to the fallout of the worldwide economic crisis, which really started to impact the Bolivian economy in late 2008 and early 2009, the country’s gross domestic product (GDP) had grown at an average of 4.8 percent under Morales. It peaked at 6.1 percent in 2008, and dropped to an estimated 3.5 percent in 2009, which was still the highest projected growth rate in the region. This growth was based principally on high international prices in hydrocarbons (especially natural gas) and various mining minerals common in Bolivia. Government revenue increased dramatically because of changes to the hydrocarbons tax regime in 2006. But fiscal policy remained austere until the global crisis struck. Morales ran budget surpluses, tightly reined in inflation, and accumulated massive international reserves by Bolivian standards. Public investment in infrastructure, particularly road building, increased significantly, but social spending rose only modestly in absolute terms, and actually declined as a percentage of GDP under Morales. One of the dominant theoretical and practical innovations of Latin American neostructural economic theory has been proactive labor flexibility, or the prioritization of state efforts to build consensus among workers around submission to the imperatives of export-led capitalist development in a fiercely competitive world system. States attempt to co-opt and reengineer labor movements so that they abandon class struggle in favour of cross-class cooperation and stability in labor-state relations. This synergistic relationship is thought to make all social classes winners under the development model, and advance “systemic competitiveness” of the country as it inserts itself ever more deeply into international markets. In Bolivia under the MAS, this framework has taken the form of strategic co-optation and division of labor and peasant movements on the part of state managers, while capital simultaneously seeks to deepen the flexibility and precariousness of the workforce to its advantage. While the rate of exploitation has risen under the MAS, the strategy of the state and capital has not unfolded seamlessly. There are many who continue to believe that the process of reform has run more deeply than I have suggested. The radical trajectory of the government in its first term is frequently proclaimed, and the current moment, after Morales’s decisive victory in the December 2009 elections, is seen as beckoning still further progress in the revolutionary transformation of the country’s state, society, and economy. But both Fuentes and Stefanoni are confusing the rhetorical commitments of the government to state-led industrialization with actual substantive movement toward that end, as well as superficial rhetorical similarities to the 1952 revolution with the much more limited extent of reforms actually introduced in the Morales era compared to those enacted throughout the earlier epoch. Stefanoni is correct to point out that it is increasingly apparent that the MAS has re-created the legacy of nationalist populism in a new melange fit for the twenty-first century. Fuentes refers to thirteen nationalized companies. If we focus for a moment simply on mining, we start to recognize that a more incisive and careful dissection of the realities on the ground is necessary. First, the two nationalizations—of the Huanuni mine and the Vinto mine—were a consequence of concerted struggles from below, by the mine workers and community allies, which forced the Bolivian government to act. They can hardly be seen as part of the government’s overarching agenda. The revolution of 1952 achieved the nationalization of the mines, the breaking up of the haciendas (large land holdings) through wide-scale agrarian reform, and the abolition of the hated pongueaje, a system through which indigenous rural laborers had been obliged to provide personal service to the landowner, his family, and his overseers in exchange for the ability to sow small sections of land on the hacienda. The labor movement, led by the miners, demanded the full-scale socialization of property relations and the institutionalization of workers’ control in the mines and elsewhere during the opening years of the revolutionary process. However, after the initial period in which the Movimiento Nacionalista Revolucionario (Revolutionary Nationalist Movement, MNR) was forced to enact major reforms due to pressure from popular movements, the MNR quickly turned on the workers, with the assistance of U.S. imperialism. In alliance with co-opted peasant organizations—placated by the recent land reforms—the MNR began reversing the gains of the revolution and rebuilding the army as a means of repressing the miners. In 1956, an International Monetary Fund–backed economic stabilization program was introduced, and by the time of the 1964 right-wing military coup, the state had developed an elaborate system of divide-and-rule tactics to deal with rural and urban popular sectors, repressing the most radical and integrating those who could be integrated through co-optation and the divvying out of selective benefits from the state’s purse. Leading into the second term of the Morales government, there remains the possibility of a renewal of an old social pact between fractions of the eastern bourgeois bloc and imperialist forces in their various guises, and the state bureaucracy occupied by the MAS. Such an outcome would require sufficient levels of reform to achieve the temporary quiescence of the masses, while at the same time avoiding a level of reform that would lead to reaction from the “honest,” “responsible,” and “patriotic” fractions of the bourgeoisie, and a new cycle of crisis and instability. Morales, as an indigenous president and ex-cocalero leader, may continue to have sufficient political capital—legitimacy within the popular classes and indigenous organizations—to facilitate such an outcome. Because such a conclusion would continue to avoid confronting the fundamental class strongholds in the urban and rural economies of transnational capital and their domestic allies, it could lay the basis for fundamental counter-reform over the long term. These reactionary forces—currently ideologically and politically fragmented—would over time be able to reorganize politically and socially. We should remember that the far more radical reforms initiated by the MNR following the 1952 revolution were nonetheless overturned by the far right in a military coup in 1964, in part because the revolution never evolved from left-populist to genuinely socialist and indigenous-liberationist. At the same time, a second exit to the post–December 2009 conjuncture might be that the country polarizes once again in dramatic ways, that social movements obtain some autonomy, at least from the more conservative wings of the MAS, and that the left-indigenous forces of the country are once again pitted in open confrontation against the social forces of the right. In such a process, reforms might become increasingly broad, and revolutionary possibilities increasingly plausible once again. Such a virtuous circle of momentum might inspire the masses to take the situation into their own hands, to take over large land holdings in the countryside and workplaces and communities in the cities. As I have suggested, however, the second possibility must be the product of the self-activity and self-organization of the popular classes themselves, as the leadership of the governing party will not initiate such action on its own, and, indeed, will resist it until it becomes impossible to resist. This was patently true in the political economy of the first year of the Morales government, and no less so in the economic structure, fiscal policy, spending patterns, and inequality and poverty outcomes over the next three years (2007–2010). Bolivian popular movements have been at the cutting edge of resistance to neoliberalism in Latin America in recent years. Latin America, in turn, has been the region of the world most militantly opposed to the social depravities of neoliberalism. Radical left-indigenous movements rose up in an insurrectionary cycle with a breadth and intensity unparalleled in the Western hemisphere in the first five years of the current century. The popular upheavals of the Water War against privatization in 2000 turned the tide against the previous fifteen years of right-wing assault. This was followed by the ousting of two neoliberal presidents in the Gas Wars of 2003 and 2005, through mass extra-parliamentary insurrections—Gonzalo Sánchez de Lozada and Carlos Mesa, respectively, were tossed out in the course of these street battles. All this laid the basis for Evo Morales’s successful bid to become the country’s first indigenous president, as leader of the MAS, in the December 2005 elections. He then consolidated this position four years later, with 64 percent of the popular vote in December 2009, on a 90 percent voter turnout. An analytical framework for understanding the insurrectionary cycle between 2000 and 2005 and, most importantly, its relationship with the political-economic trajectory of the MAS government during its first four years in office (2006–2010), is more urgently required than ever before. It is necessary to consistently separate image from reality, rebellion from reform, with empirical and historical clarity, and remain in fundamental solidarity with the aims of anti-imperialist, socialist, and indigenous-liberationist transformation in the country, the hemisphere, and, eventually, the world. What becomes clear through an honest appraisal of the historical record is that the left-indigenous insurrectionary period between 2000 and 2005 did indeed amount to a revolutionary epoch, even if its main protagonists have not yet achieved a social revolution. As politics shifted from the streets to the electoral terrain after the May–June 2005 revolts and the lead-up to the December 2005 elections, we witnessed the common turn toward a dampening of revolutionary possibilities and social movements demobilized as a moderate political party came to office. Those elections catalogued the demise of traditional neoliberal parties in Bolivia and popular rejection of their political and economic legacies. Unfortunately, given its changing class composition, ideology, and strategy over the few years leading up to those elections, the party the masses elected into the state apparatus had moderated dramatically since its origins. The election of Evo Morales signified an historic blow against informal apartheid race relations in the country, and was rightfully celebrated domestically and internationally as a major democratic step forward for the country. But it was also true, and harder for many to come to terms with, that the MAS had long since abandoned the perspective of simultaneous liberation from class exploitation and racial oppression of the indigenous majority. Rather, the party had shifted ideologically and programmatically toward a crude model of stages, where a much thinner, cultural decolonization of race relations was promised immediately, while socialism was deferred to a distant future. It should perhaps have been less surprising than it was for many that the first year of the Morales government saw only modest breaks with the inherited neoliberal orthodoxies—limited essentially to foreign relations with Cuba and Venezuela and the International Monetary Fund, and domestic policy in the hydrocarbons sector. At the same time, while popular movements had struggled for a revolutionary constituent assembly to refound the country, the actual assembly established by the government in 2006 was a poor substitute, indeed more reminiscent of the proceedings of the existing liberal congress than a participatory and revolutionary rupture with the status quo. If the first year of the Morales administration was characterized by steady movement away from rebellion and toward reform, the next three years (2007–2010) consolidated that turn in the form of reconstituted neoliberalism. The new model abandoned features of neoliberal orthodoxy, but retained its core faith in the capitalist market as the principal engine of growth and industrialization. Government revenue spiked, but international reserves were accumulated at record levels, while social spending decreased as a proportion of GDP. Budget surpluses were tightly guarded, as were inflation rates. Rates of poverty and levels of social inequality showed little alteration. Precarious and flexible labor conditions have persisted. Indeed, they have even been encouraged in many ways, including the denunciation of workers as “counterrevolutionary” when they attempt to organize independently against these trends and for other improvements in their living standards and working conditions. The arguments advanced above clearly run against the standard accounts of the Morales government from both the right and the left. Left critics of my position might reasonably ask whether I am not being too hard on the Morales government, given the structural impediments of global capitalism and imperialist threats. Elsewhere, I have discussed at some length the dynamics of contemporary capitalist imperialism and the unusually wide window for change in contemporary Bolivia under current conditions. This, I hope, constitutes at least an opening response to the first objection. Others might suggest that our priority—especially as activists based in the Global North—must be to defend Morales uncritically because his government represents a resolutely anti-imperialist power in a hostile world, which can only be a good thing. I would like to conclude by responding to the second possible objection by way of a cursory glance at the World People’s Conference on Climate Change and the Rights of Mother Earth, held in Cochabamba in April 2010. It was undoubtedly an historic step forward for ecosocialist internationalism to have tens of thousands of activists—mainly from the Global South, and particularly from Latin America—gather in Cochabamba with the premise that the capitalist system is the principal enemy of nature. There are also extraordinarily good reasons to celebrate Morales’s vigorous denunciations of the hypocrisy and arrogance of leaders of the key imperialist countries at the Copenhagen climate talks in late 2009. He spoke to the aspirations of the thousands resisting in the streets, facing repression and lengthy prison sentences for civil disobedience in the name of preventing the regularized destruction of the earth’s ecosystems. We can celebrate this gathering as an initial step forward against imperialism and for building the incipient networks for an authentically anti-capitalist, ecologically sane, and internationalist socialism. At the same time, we must not shy away from the contradictions of what is happening domestically in Bolivia, many facets of which I trace at length in my new book, From Rebellion to Reform in Bolivia: Class Struggle, Indigenous Liberation, and the Politics of Evo Morales (forthcoming from Haymarket Books). We must avoid simply putting our faith in the benevolent leadership of state leaders who pledge a commitment to “twenty-first century socialism” in international forums. The contradictions of Morales’s moves to extract and industrialize raw materials in “partnership” with transnational mining and petroleum capital—leading inevitably to the exploitation of workers and the dispossession of indigenous peasants located on and around natural resource deposits—calls into question a simple relationship between Morales and ecosocialist struggle internationally. Major social struggles are likely to emerge in the near future as debates in Bolivia unfold as to if and how the development of massive lithium deposits will proceed in the country. Taking a position of uncritical loyalty to the MAS government will likely put many well-intentioned progressives on the wrong side of indigenous peasant and proletarian struggles for justice in many instances.29 Likewise, in Ecuador, indigenous popular movements have often been pitted against the extractive industrial policies of “twenty-first century socialist president” Rafael Correa. My new book offers, among other things, a response to the dominant view of Evo Morales’s development project in Bolivia on the international left, a view that is steeped in romanticization. Predictably, the debates occurring inside the country are much more richly grounded in the real contradictions there than what too often passes for analysis outside the country. For example, we should have been with the Bolivian workers when they were demanding decent wages in May 2010, and we should have opposed Morales on that question.30 We should stand in solidarity with the peasants and workers who take on the mining multinationals, such as the opposition to Japanese capitalists in the San Cristóbal mine, not with the Morales government on these questions. And, of course, we could give many more examples. Second, we should be clear that the Morales government is not the only force in Bolivia fighting imperialism, nor does the government consistently take anti-imperial positions. Should anti-imperialists automatically defend Morales, for instance, even when he aligns with transnational mining and petroleum capital against the interests of indigenous peasant communities? To do so is not serious left politics, it seems to me. In such instances, Morales is in fact channeling imperial economic power and guaranteeing a legal environment for their ongoing exploitative practices. This is happening against the interests of the popular classes and against the interests of ecologically sustainable development that meets authentic human needs. Morales does so, it has been recognized, at the same time as he hosts the Cochabamba climate conference, which was an important gathering in terms of building ecological consciousness and organization on an international scale. Our politics must be sufficiently mature and nuanced to understand the importance of defending the best possibilities of initiatives such as the Cochabamba gathering, while condemning the gap between rhetoric and reality when it comes to building communitarian socialism inside Bolivia. The peasants, workers, and community members who recently took on the mining companies through direct actions at the San Cristóbal mine are at the forefront of anti-imperialism in Bolivia, and they are deserving of our solidarity, even when their actions run directly against the Morales administration. Such adherence to principle, and nuanced, complex, and open revolutionary politics, does not align us with imperial capital and states who would rather see Morales pushed out of office. We will resist them, too, at every turn. The hope for Bolivia’s future remains with the overwhelmingly indigenous rural and urban popular classes, organizing and struggling independently for themselves, against combined capitalist exploitation and racial oppression, with visions of simultaneous indigenous liberation and socialist emancipation guiding them forward, as we witnessed on a grand scale between 2000 and 2005. Jeffery R. Webber is a lecturer in the School of Politics and International Relations at Queen Mary University of London. He is the author of Red October: Left-Indigenous Struggles in Modern Bolivia (2010); From Rebellion to Reform in Bolivia: Class Struggle, Indigenous Liberation, and the Politics of Evo Morales (2011); and, co-editor with Barry Carr, of The Resurgence of Latin American Radicalism: Between Cracks in the Empire and an Izquierda Permitida (2011). He is on the editorial collectives of Historical Materialism and Latin American Perspectives. 1 This article draws from sections of my forthcoming book, From Rebellion to Reform in Bolivia: Class Struggle, Indigenous Liberation, and the Politics of Evo Morales (Chicago: Haymarket, 2011). The sources for data on economic and social trends touched on in this article are cited more comprehensively in the book, and their significance is explained at much greater length. 2 “The explosive apex of Evo’s power: Bolivia’s presidential election,” Economist, December 10, 2009. 3 See Pablo Stefanoni, “Bolivia después de las elecciones: ¿a dónde va el evismo?” Nueva Sociedad, No. 225, January–February 2010, 4–17; and, on the recall and constitutional referendums, see Pablo Rossell, “El proyecto de Evo Morales más allá de 2010,” Nueva Sociedad, No. 221, May–June 2009, 23–32. 4 Atilio A. Borón, “¿Por qué ganó Evo?” Rebelión, December 8, 2009. 5 Rosa Rojas, “Arrasa Evo Morales: Gana relección y el MAS tiene mayoría en el Congreso,” La Jornada, December 7, 2009. 6 Stefanoni, “Bolivia después de las elecciones,” 4–5. For a discussion of the origins and trajectory of the eastern bourgeois bloc, see Jeffery R. Webber, “Carlos Mesa, Evo Morales and a divided Bolivia (2003–2005),” Latin American Perspectives, Vol. 37, No. 3, May 2010. 8 Judy Rebick, “Bolivia re-invents democratic socialism with indigenous people in the lead,” www.rabble.ca, November 14, 2009. 9 Naomi Klein, “Bolivia’s fight for survival can help save democracy too,” Guardian, April 22, 2010. 11 Ana Esther Ceceña, “Es el tiempo de crear el sistema del vivir bien y el manantial está en Bolivia,” La Epoca, December 11, 2009. See also Ángel Guerra Cabrera, “La victoria de Evo y las nuevas ame?nazas,” La Jornada, December 11, 2009. 12 Quoted in Hugo Moldiz Mercado, “Evo pide acelerar el camino al socialimso,” La Epoca, December 10, 2009. 13 For a discussion of the way forward after Copenhagen, see Mike Davis, “Who will build the Ark?” New Left Review, II, 61, January–February 2010, 29–46. 14 See Jorge G. Castañeda and Marco A. Morales (eds. ), Leftovers: Tales of the Two Latin American Lefts (New York: Routledge, 2008). 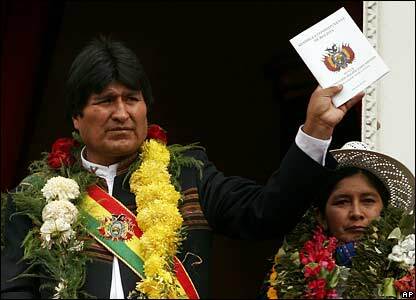 15 “Bolivia’s new constitution: A passport to utopia,” Economist, January 22, 2009; Michael Reid, “Latin drift: Sorting Latin America’s pragmatists from its populists,” Economist, November 19, 2008; “The explosive apex of Evo’s power,” Economist, December 10, 2009. 16 Diego Ore and Eduardo García, “Bolivia nationalizes four power companies,” Washington Post, May 2, 2010. 17 Representative examples of the conservative position are Franz Xavier Barrios Suvelza, “The weakness of excess: The Bolivian state in an unbounded democracy,” in John Crabtree and Laurence Whitehead, eds., Unresolved Tensions: Bolivia Past and Present (Pittsburgh, PA: Pittsburgh University Press, 2008); José Luis Roca, “Regionalism revisited,” in Crabtree and Whitehead, Unresolved Tensions; Juan Antonio Morales, “Bolivia in a global setting: Economic ties,” in Crabtree and Whitehead, Unresolved Tensions; and Horst Grebe López, “Estado y mercado en Bolivia: Una relación pendular,” Nueva Sociedad, Vol. 221, May–June 2009, 137–150. And of the liberal position: George Gray Molina, “State-society relations in Bolivia: The strength of weakness,” in Crabtree and Whitehead, Unresolved Tensions; Xavier Albó, “The ‘long memory’ of ethnicity in Bolivia and some contemporary oscillations,” in Crabtree and Whitehead, Unresolved Tensions. 18 See, for some representative examples, Pablo Stefanoni and Hervé Do Alto, Evo Morales de la coca al palacio: Una oportunidad por la izquierda indígena (La Paz: Malatesta, 2006); Shirley Orozco Ramírez, “Historia del Movimiento al Socialismo (MAS): Trayectoria política e ideológica,” Barataria 1, No. 2, 2004, 16–22; Pablo Stefanoni, “MAS-IPSP: la emergencia del nacionalismo plebeya,” Observatorio Social de América Latina, No. 12, 2003, 57–68; María Teresa Zegada, Yuri F. Tórrez, and Gloria Cámara, Movimientos sociales en tiempos de poder: Articulaciones y campos de conflicto en el gobierno del MAS (La Paz: Plural Editores, 2008); Jorge Komadina and Céline Geffroy, El poder del movimiento politico: Estrategia, tramas organizativas e identidad del MAS en Cochabamba (1999–2005) (Cochabamba: CESU-UMSS, 2008); Karin Monasterios, Pablo Stefanoni, and Hervé Do Alto, eds., Reiventando la nación en Bolivia: Movimientos sociales, Estado y poscolonialidad (La Paz: Plural Editores, 2008); Jim Shultz, “‘Evonomics’ Gets a Second Term,” NACLA Report on the Americas, Vol. 43, Issue 1, January–February 2010, 4–5; Nancy Postero, “Morales’s MAS government: Building indigenous popular hegemony in Bolivia,” Latin American Perspectives, Vol. 37, No. 3, May 2010, 18–34. Luis Tapia is, by far and away, the most interesting in this camp. He is ultimately supportive of the MAS project, but is uniquely unromantic and often has highly perceptive critiques to offer. See, for example, Luis Tapia, Pensando la democracia geopolíticamente (La Paz: Muela del Diablo Editores, 2009); Política salvaje (La Paz: Muela del Diablo Editores, 2008); and La coyuntura de la relativa autonomía del Estado (La Paz: Muela del Diablo Editores, 2009). 19 Examples of this eclectic group of thinkers include: various contributors to Gustavo Ayala and Luis Tapia, eds., Amanecer en Bolivia: Los movimientos sociales y el cambio (Quito: Ediciones La Tierra, 2007), particularly the chapters by Jorge Viaña and Marxa Chávez; Raúl Zibechi, “Bolivia-Ecuador: El Estado contra los pueblos indios,” Rebelión, July 19, 2010; Lorgio Orellana Aillón, Nacionalismo, populismo y régimen de acumulación en Bolivia (La Paz: CEDLA, 2006); Raquel Gutiérrez Aguilar, Los Ritmos del Pachakuti: Movilización y levantamiento indígena-popular en Bolivia desde la perspectiva de emancipación (2000–2005) (La Paz: Textos Rebeldes, 2008); Jeffery R. Webber, Red October: Left-Indigenous Struggles in Modern Bolivia (Leiden: Brill Academic Publishers, 2010); Forrest Hylton and Sinclair Thomson, Revolutionary Horizons: Past and Present in Bolivian Politics (London: Verso, 2007); Enrique Ormachea Saavedra, ¿Revolución agraria o consolidación de la vía terrateniente? El Gobierno del MAS y las políticas de tierras (La Paz: CEDLA, 2008); Enrique Ormachea Saavedra, Soberanía y seguridad alimentaria en Bolivia: Políticas y estado de situación (La Paz: CEDLA, 2009); Silvia Escóbar de Pabón, Situación de los ingresos laborales en tiempos de cambio (La Paz: CEDLA, 2009); Silvia Escóbar de Pabón, Situación del empleo en tiempos de cambio (La Paz: CEDLA, 2009); Marxa Chávez, “Weaving the Rebellion: Plan 3000, Center of Resistance in Eastern Bolivia,” Socialism and Democracy, Vol. 23, No. 3, 2009, 101–116 ; and the contributions by Máximo Quisbert Quispe, Rafael Bautista, Pablo Mamani Ramírez, Ximena Soruco Soluguren, Lucila Choque Huarin, Silvia Rivera Cusicanqui, and Esteban Ticona Alejo to the first two issues (2008 and 2009) of the new journal Willka: Análisis, pensamiento y acción de los pueblos en lucha. 20 For one classical representative statement of this perspective, see Osvaldo Sunkel, Development from Within: Toward a Neostructuralist Approach for Latin America (Boulder, CO: Lynne Reinner Publishers, 1993). 21 Drawing on data from Bolivia’s National Institute of Statistics, the best study thus far charts poverty and extreme poverty trends up to 2007, which are the latest available figures. The study notes that since 2005 there has been only marginal change in the poverty rate, and that this change has been slightly upward, from 59.9 percent of the population in 2005 to 60.1 percent in 2007. Levels of extreme poverty increase from 36.7 to 37.7 percent over the same two-year period. At the same time, other categories relevant to living standards, such as household density, and access to electricity, running water, and sewage systems, all show modest improvements between 2005 and 2007. It is possible that poverty levels have improved since 2007, and it should also be noted that these figures do not take into account improvements in the social wage of workers and peasants—i.e., any improvements in social services for the poor. Again, however, social spending has actually declined as a percentage of GDP under Morales, even as it increased in real, inflation-adjusted terms. The record on poverty shows that there is little to celebrate. The key data here is derived from Mark Weisbrot, Rebecca Ray, and Jake Johnston, Bolivia: The Economy During the Morales Administration, Center for Economic and Policy Research, December 2009, 16. It ought to be noted the poverty figures from ECLAC do not correspond with the figures discussed here. The latest ECLAC publications provide national figures for 1999 and 2007, and claim that there has been a downward shift in Bolivian poverty from 60.6 percent poverty to 54 percent poverty between these years. See ECLAC, Anuario Estadístico de América Latina y el Caribe, 2009, 2009, 65. Inequality, likewise, remains a huge barrier to achieving social justice in the Bolivian context. Between 2005 and 2007, income inequality, as measured by the Gini coefficient, declined from 60.2 to 56.3. Figures for the distribution of Bolivian national income show that the poorest 10 percent of the Bolivian population received 0.3 percent of national income in 1999, and still received only 0.4 percent by 2007, the last available figure. Meanwhile, the richest 10 percent of the population took home 43.9 percent of national income in 1999 and precisely the same percentage in 2007. If we broaden our perspective, to compare the bottom and top fifths of the social pyramid, we reach similar conclusions. The poorest 20 percent of society took in a mere 1.3 percent of national income in 1999 and, in 2007, a still-paltry 2 percent. The richest 20 percent of the population pocketed 61.2 percent of national income in 1999 and 60.9 in 2007. In other words, there has been almost no change on either end of the scale in terms of the redistribution of income, never mind the redistribution of assets. See, Weisbrot, Ray, and Johnston, Bolivia: The Economy, 18, for inequality figures employed here. 22 Federico Fuentes, “Bolivia: Between Mother Earth and an ‘extraction economy,’” The Bullet, Socialist Project E-Bulletin, No. 355, May 17, 2010. 23 Pablo Stefanoni, “Bolivia después de las elecciones,” 5. 24 Ibid., 14. There is an increasing rupture between the socioeconomic and sociocultural dimensions of evismo, with intensifying class differentiation and stratification within the indigenous nucleus of MAS supporters, and one way to maintain the cohesion of the social base in light of these growing contradictions has been the appeal to indigenous populist nationalism. See Pablo Rossell, “El proyecto de Evo Morales más allá de 2010,” Nueva Sociedad, No. 221 May–June 2010, 27. 25 James Malloy and Eduardo Gamarra, Revolution and Reaction: Bolivia, 1964–1985 (New Brunswick, NJ: Transaction Books, 1988), 16. 26 Osvaldo Guachalla, “La exacerbación de la política extractivista del MAS: Privatización con fachada nacionalista,” El Observador, Vol. 4, No. 8 January 2010, 14–15. 27 Silvina Heguy and Pablo Stefanoni, “‘No hay una agenda oculta: la Constitución respeta la propiedad’: Entrevista a García Linera,” Clarín, December 6, 2009. 28 The official conspiracy theories concocted by state managers escalated when the COB called, on Thursday, May 6, for a general strike to begin on Monday, May 10, in the event that the government did not respond to the workers’ demands for a better salary increase. García Linera intimated that the United States and the domestic right were behind the call for a general strike, which he compared to earlier (authentic) right-wing destabilization campaigns that the Morales government had endured. “Those who have been a part of union struggles know that general strikes have a political content; general strikes are declared to overthrow governments,” García Linera argued. He said that right-wing groups since 2006 “have tried coup d’états, assassinations, and now they are attempting [destabilization] from within; the right uses these measures, and I wouldn’t doubt that behind this there also could be North American functionaries.” See, “Bolivia: Principal sindical obrera desafía a Evo Morales con huelga general,” La Razón, May 7, 2010. 29 For discussion of the Latin American left’s relationship to extractive industries, and the lithium debates in Bolivia more particularly, see Eduardo Gudynas, “El Nuevo extractivismo progresista: Tesis sobre un viejo problema bajo nuevas expresiones,” El Observador, Vol. 4, No. 8, January 2010, 1–10; Osvaldo Guachalla, “La exacerbación de la política extractivista del MAS: Privatización con fachada nacionalista,” El Observador, Vol. 4, No. 8, January 2010, 11–16; Rebecca Hollender and Jim Shultz, “Bolivia and its lithium: Can the ‘gold of the 21st century’ help lift a nation out of poverty?” Democracy Center, May 2010, http://democracyctr.org/pdf/DClithiumfullreportenglish.pdf. 30 See “Bolivia: Alza salarial propuesta por Evo genera rechazo y ?amenazas de huelga,” La Razón, May 3, 2010; see also, Carlos Arze Vargas, “El aumento salarial del ‘vivir bien,’” Nota de Prensa, CEDLA, May 2010; Confederación General de Trabajadores ?Fabriles de Bolivia, “Rechazamos el incremento salarial de 5%,” Nota de Prensa, April 27, 2010. About 200 farmers from Zongo took over the COBEE plant, owned by the Israeli firm Inkia Holdings, to demand payment of a royalty for the use of local water sources. ...it purports to combat global warming without reducing greenhouse gas emissions, and without putting the capitalist system and its excesses—the real causes of environmental disaster—on the table. Indigenous activists in Bolivia have been holding a mass coca-chewing protest as part of campaign to end an international ban on the practice.